Recognized as the worldwide leader in the polymer concrete trench drain industry, ACO offers quality manufacturing, complete technical assistance and a variety of specialized channels, for your projects specific applications. ACO’s drain system provides greatly improved drainage wherever needed: outside along and acress highways, airport runways, curbs, pedestrian walkways, parking lots, playgrounds, and sports fields. Inside, Channel slope is perfect for factories, garages, warehouses, chemical processing plants, washdown areas, automotive service areas, agricultural buildings and food processing plants(ACO Trench Drain is USDA approved). 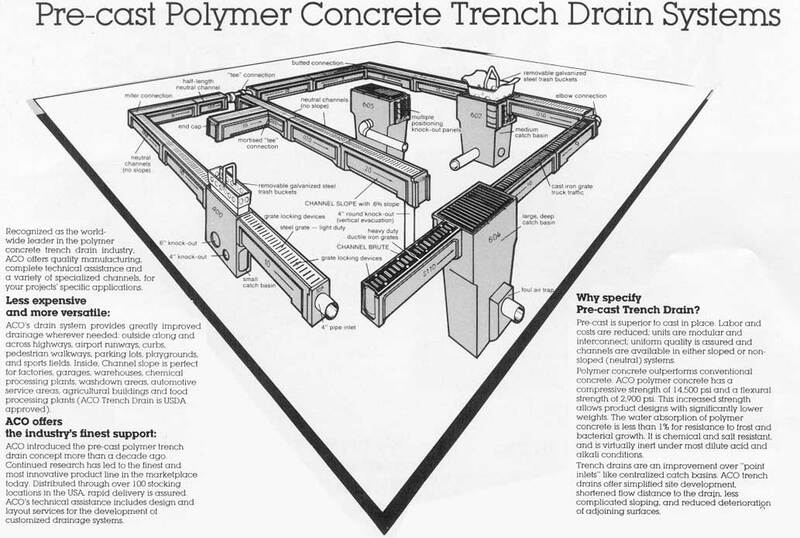 ACO introduced the pre-cast polymer trench drain concept more than a decade ago. Continued research has led to the finest and most innovative product line in the marketplace today. Distributed through over 100 stocking locations in the USA rapid delivery is assured ACO’s technical assistance includes design and layout services for the development of customized drainage systems. Why specify Pre-cast Trench Drain? Pre-cast is superior to cast in place. Labor and costs are reduced; units are modular and interconnect; uniform quality is assured and channels are available in either sloped or non-sloped (neutral) systems. Polymer concrete outperforms conventional concrete. ACO polymer concrete has a compressive strength of 14,500 psi and a flexural strength of 2,900 psi. This increased strength allows product designs with significantly lower weights. The water absorption of polymer concrete is less than 1% for resistance to frost and bacterial growth. It is chemical and salt resistant, and is virtually inert under most dilute acid and alkali conditions. Trench drains are an improvement over “point inlets” like centralized catch basins. ACO trench drains offer simplified site development, shortened flow distance to the drain, less complicated sloping, and reduced deterioration of adjoining surfaces.